Normally, a user is authenticated by a username-password pair. At first, it may seem a viable solution. But as more and more sites come up, users are bound to have multiple accounts and multiple username-password pairs for different sites. It becomes more difficult to keep track of the credentials and forgetting passwords is a common phenomenon. Even your password manager leaves you insecure. Even those social one click login buttons are not secure enough because they often share your personal information without your knowledge. Get yourself a OneID and you never have to use your credentials again. OneID does exactly what it says – giving you a single identity for everything you do on the web. With OneID, your privacy is maintained and you get to decide how much information you want to share. OneID keeps all your necessary information in an encrypted format that is accessible only by you. All OneID transactions are carried out with the help of three key elements – your OneID, your OneID repository and your OneID registered device. 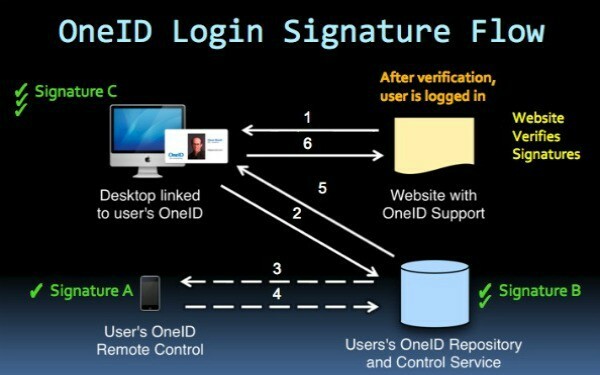 Due to its device-centric nature, OneID transactions can only be performed on a pre-registered device.